Much of the press around the launch of Google+ has pitted it squarely against Facebook. This was highlighted painfully for Facebook with their (misguidedly dubbed) "awesome" announcements yesterday. Their launch of a new design, video calling, and group chat might have been exciting, had not Google announced its Hangout feature for Google+ a week earlier (and by the way, introduced their own 1-on-1 video calling inside of Gmail way back in 2008). Hangouts took video calling a step further and introduced multi-person video chat with up to 10 people. Facebook is definitely feeling challenged, if not threatened. They've been blocking attempts by Google+ users to pull their contact information out of Facebook. And even more damning, their PR firm Burson-Marsteller has contacted journalists asking them to run stories on privacy issues with Google+. This isn't the first time Burson-Marsteller stirred up controversy—only earlier this year they tried the same tactic, asking various outlets to run stories about Google privacy issues. But Google+ can't be a Facebook killer just yet. The Limited Field Trial has been preventing most users from being able to add the majority of their contacts to the system. The majority of users right now are techies. People you'd expect to be early adopters anyway. With most people inside the walls being complete strangers, those lucky enough to get in have been treating Google+ more like Twitter. They add people to their "Following" Circles and broadcast their posts publicly, starting connections and conversations with their fellow-nerd-strangers—especially the high-profile ones. Google+ developers have made themselves amazingly accessible to the public, responding to feedback and demonstrating the features of Google+ in a highly public way. The resharing feature (akin to the original "retweet", before Twitter started grouping them together with their official implementation) has been widely used, ensuring that every share from +Vic Gundotra (Google+'s head honcho) ends up making its way into most people's streams. The truth is, Google+ is just as good, if not better, for public broadcast as it is for private conversations. As +Kevin Rose of Digg stipulated yesterday, it may even be a better blogging platform—like Tumblr for adults. You can post long-form essays, and your audience is right there to receive it in their personal stream. The share button pushes it out to your follower's followers, and before you know it, your thoughts have started an open debate in front of the biggest minds at Google, tech Media, and eventually (once they open this baby up), the world. For brands, celebrities, and others who tend to attract a high number of followers, this opens the door for easy flash-polls. It lets your followers meet each other and make friends. You could even start a public hangout and spend a some time with a handful of your fans, face to face. Just wait until Lady GaGa and Justin Beiber make it in (+Alyssa Milano already did). Google+ shows that Twitter's primary strengths are also its weaknesses. The 140 character limit has forced everyone to have to get a shortened link. Conversations between two people are not always easy to follow, and difficult to maintain. Conversations between more than two people? Forget about it. Long form thoughts must be posted elsewhere, then linked to. To address some of these issues, Twitter is testing out more Facebook-like features on its site. Links will now auto-shorten if entered via their website. Mentioning and replying to users directly allows for a 1-on-1 conversation, snippets of which can be seen in the right column by clicking on a tweet in your timeline. It's still clunky though, and the barrier to two-way communication, gives the perfect excuse for ignoring the masses who might respond to you. The 140 character limit does, however, allow for a more scannable stream. 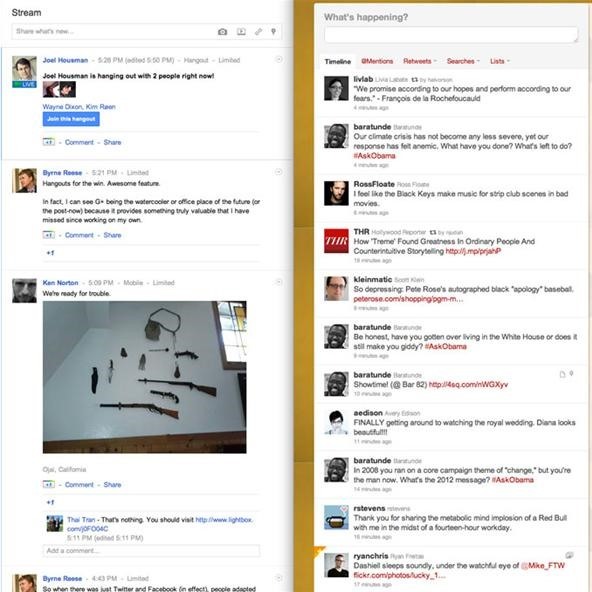 Mike Monteiro captures the differences between Google+ and Twitter in this screenshot. As he points out, the Twitter feed is a lot denser and uniform in its layouts, while the Google+ stream varies because of the different kinds of posts Google+ allows you to share—pictures are posted, conversations can be short or long, and comment streams can get pretty long. Using the keyboard shortcuts "j" & "k" to scan up and down your G+ stream can make it a lot easier to jump past the posts that don't interest you, but at the end of the day, is that a feature your mother is going to learn about & use? So what do you think? Do you prefer Google+'s long-form & dialogue-enabled approach to social media broadcast & consumption, or do you like how Twitter's 140 character stream forces people to get to the point, or get buried?